A well-known computer company has told a Vancouver Island school to drop its apple logo. 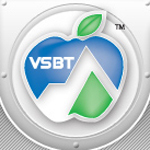 The Victoria School of Business and Technology started using a blue and green apple logo in 2005, but two weeks ago the school received a cease and desist letter from Apple Inc. in the U.S., telling it to get rid of the logo. i noticed they are the both “apples” but seriously who in there right mind is going to confuse those two logos?! what about these Apple might as well sue them too. What about Manhattan, KS being the “Little Apple”? Surely that’s an infringement on the Mac Mini.